SportsKPI, a leading sports analytics services and solutions provider will be hosting a seminar on Sports Analytics this Sunday, 3 PM at Narsee Monjee Institute of Management Studies (New Campus), Bannerghatta Road. It is a very well-known fact that that the Sports Analytics has played a vital role in winning games and making champions. In recent past, Hero I-League Champions, Bengaluru FC have leveraged analytics to the fullest extent. 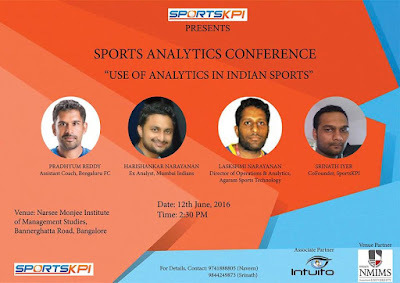 To share the analytical knowledge, sports experience and, to connect with the coaches and analysts working in the industry, SportsKPI brings the first Sports Analytics conference. There will be talks on evaluating the performance of the Kabaddi raiders using analytics by Srinath Iyer and the role of a performance analyst for an IPL franchise by Harishankar Narayanan, ex-analyst of Mumbai Indians. The main attraction of the evening will be a discussion on the use of analytics in football scouting by Pradhyum Reddy, Assistant Coach, Bengaluru FC. NMIMS is hosting the event at their new campus situated in Bannerghatta Road. The event is absolutely free for the students. For any sort of queries, feel free to contact here - 9741888805/9844249873.